Baguio Horse Trails | Exploring Baguio on Horseback | Go Baguio! Many enjoy exploring the hills of Baguio City on horseback. A regular one hour trail ride is very common, especially for young adults. Now that most Baguio roads are fully developed, a lot of the trail rides, except for the one in Camp John Hay at "Shalan di Kabajo" are accessed via paved roads. It is essential to take a riding guide along with you to take you there, and more importantly, for him to be around to help the riders and horses along the way. The ratio is 1 guide to 2-3 riders. The guide can be a walking guide (cost is usually whatever the hourly rate for horse rental is) if you plan on a slow ride, but if your group is more experienced, then the guide will be a riding guide, bringing along his horse or renting one for this purpose so it's the same cost. The trail rides listed here are the most popular ones emanating from Wright Park Riding Circle. There are also horses available beside Baguio Country Club and inside Camp John Hay, and I will tell you a little more about these, too. You will climb up from Wright Park passing through Gibraltar Road, enter through some residential roads, some of which are not paved, and head on back down through Outlook Drive or vice versa. Horses are not allowed on the Mines View Market road anymore and may not pass in front of The Mansion (the Philippine president's Summer residence). This is not a very long trail, so you get to ride around the Riding Circle for 15-20 minutes upon your return. You will turn at the Pacdal rotunda towards Park Drive, which has recently been renamed Nanoy Ilusorio Drive, then turm left at the fork to Country Club Drive. Past Baguio Country Club and right before the Camp John Hay (secondary) entrance, you will go down to Happy Hollow Barangay. The length of your ride depends on how deep into Happy Hollow you go. I have gone to the end of this trail and let me tell you that it gets narrower as you go deeper -- sometimes requiring you to walk your horses on single file. So when the trail gets to difficult for you, depending on your experience as a rider, just turn around and go back. This trail used to be the best of them all. You go past Pacdal, up towards Ambuklao Road. You turn to Tiptop and there used to be a plateau where you could ride your horse hard and pretend you were a true cowboy! These days, the Marlboro Country trail passes through the same route without the hard ride in between. Honestly, when we take horses out this route, we prefer to go up, past the turn to Marlboro Country, straight towards Beckel instead and back. Sometimes this trail takes less than 2 hours, depending on the experience level of the riders and the amount of human and vehicular traffic passing through Pacdal, which is great because it leaves us with time to take in a few rounds more at Wright Park Riding Circle. What About Getting Horses from Baguio Country Club Ponies? 1. First, please note that these ponies are not affiliated with Baguio Country Club, they are merely tethered there (between the BCC and Camp John Hay properties. 2. If you are planning to go on a short and slow trail though Happy Hollow, you can source your ride from here, although Wright Park, undoubtedly has a better choice of, horses and can use that trail as well. Camp John Hay's "Shalan di Kabadjo"
Camp John Hay has one trail, which is a very nice one indeed. This is recommended for teenagers and adults but not for little children. Shalan di Kabadjo can be translated to "Way of the Horse." GoBaguio! is not in the business of selling or promoting horse trail rides or in horse rentals. I am merely an avid rider, and am recounting to you my personal favorite horse trails. 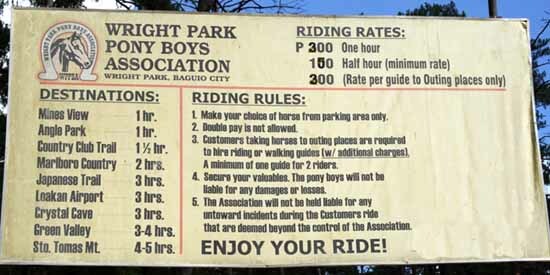 Should you be an inexperienced adult rider, I would suggest the Camp John Hay trail, or perhaps an hour at Wright Park Riding Circle before you go on the longer rides. Trail rides are not suitable for little children. If I remember correctly, we still headed up towards Beckel to Ambuklao Road, turned somewhere and ended up at Ambiong Road. We passed through some crowded residential areas on the way down. I can honestly say I enjoyed this route the least of all my rides and do not recommend it. But you can ask the Pony Boys exactly where this trail leads so you can decide for yourself. The whole of South Drive, passing via Outlook Drive on the way back. This passes fully paved roads but they provide a nice ride with a combination of slow walking downhill and a fast canter everytime the road goes uphill. Leonard Wood Road to Navy Road and back. Oh this is a very short route that will take about 30 minutes at most with the opportunity to ride up and down Navy Road (C.M. Recto). Recently, this route has been offered at Wright Park although it is not listed. I know this because Ihis is where my house is and I see horses passing here constantly.